We’ve selected what we feel are the key examples of Contemporary Mexican Homes. We aim to include Mexican residential architecture projects that are either of top quality or interesting, or ideally both. We cover completed Mexican buildings, new building designs, architectural exhibitions and architecture competitions across Mexico. The project is solved in a basic shape: a cube of three levels that sits with a half-buried level in the land, in which some orthogonal “parts” were removed to configure the interior space, getting very interesting floated prisms. The residence “Entre Arboles” (amongst trees) is the result of a deep analysis of the site. The lot is in a golf course, it is a regular rectangle of 20 by 80 meters and has 52 trees in it all of different sizes and heights. It is located in the residential area of the highest appreciation in San Luis Potosi City and a great position, having the convenience of being situated between different communication highways, important shopping centers and an unparalleled view of La Loma sports club. The architects chose a conventional scheme, an L-shaped plan slightly enlarged to the centre, where the volumes of the house are simple, strong and predominantly blind outwards, opposed to the “baroque” and uninteresting aesthetics that predominates in the condo. 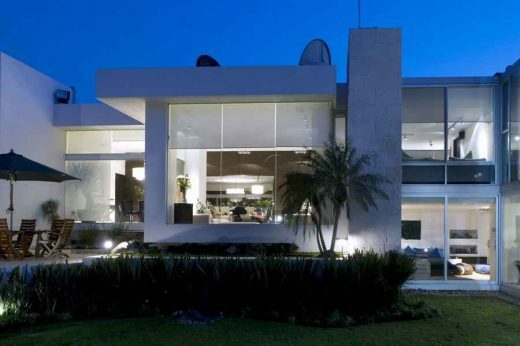 The client requested a residence in a private section of Zapopan for a family of four members. After the analysis of the program made, and as the family has teenager children, we conclude that the house had to have various levels of simultaneous interaction. The client made the request to the architect of “drawing the house in a way the house was warm, functional and one level only for the floor. It should had responded to a limited budget, a difficult context and a minimal terrain”. it was constructed within 73 m2. Sited in Valle de Bravo on a property of 1117 square meters, this house is a project at the bottom of the cliff that highlights and frames the beautiful great lake views from within. Due to the irregular ground where it is located, it has been solved in three levels to also blend into the landscape. This house is an exploration on the trace of a variety of formal and architectural lineages in the ongoing transformation of the modern dwelling that ranges from Neutra´s Kaufmann House to the Case Study Housing Program. Esplanada Studio, Lomas de Chapultepec, Mexico D.F.